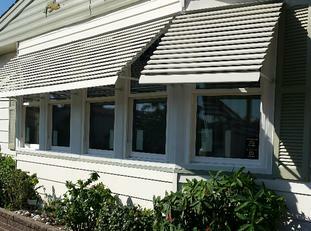 Tampa Bay and Sarasota, FL Window Gallery: Check out Our Work! 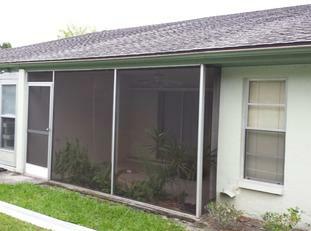 Before: Screened patio area with screen patio door. 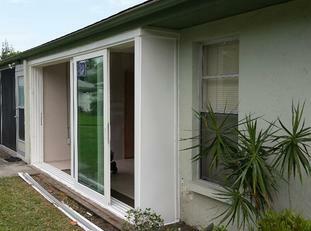 This townhouse in Sarasota was in need of extra living space and we made it happen! 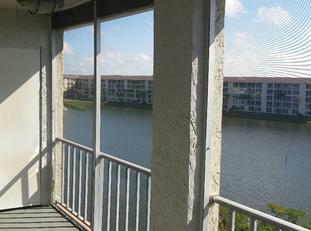 After: New PGT Winguard 570 Series Sliding Glass Door. We performed all work necessary to structurally support the building and turn the patio space into a fully functioning living space. We even installed an A/C vent! 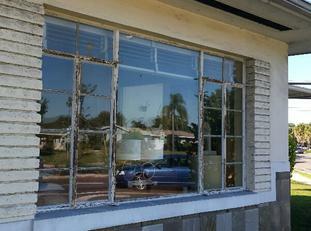 Before: Old drafty steel windows on a St. Petersburg home built in the 1920’s. 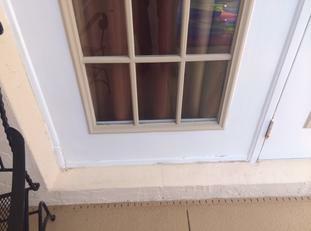 We successfully cut-out these old windows without damaging any of the existing window openings or sills. 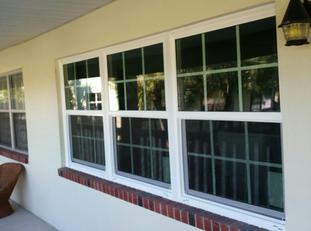 After: New PGT Winguard Impact Rated Picture Windows with custom horizontal grids between the glass. 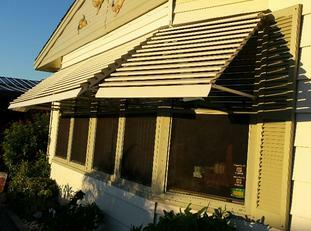 We measured the entire home so the custom grids would line-up on every window around the house. 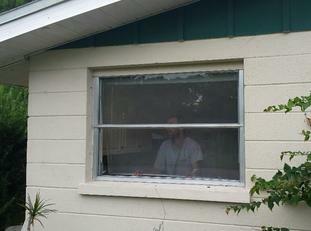 Before: Old aluminum single-pane mobile home windows in Sarasota. We removed the exterior shutters, necessary siding and J-channel to ensure no damage was done to the mobile home when removing the old windows. 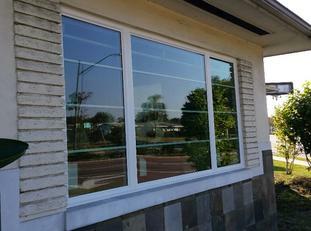 After: New PGT double-pane non-impact windows designed specifically for mobile and manufactured homes! Vinyl, low-e, Energy Star Rated, sashes that tilt-in for cleaning and more, we have the perfect replacement windows for mobile and manufactured homes! 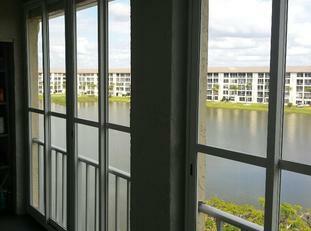 Before: Screened outdoor space off the back of this Bradenton high-rise condominium. This customer wanted a space that was not susceptible to rain and wind, but still feels like an outdoor space. Needless to say, we had exactly what they were looking for! 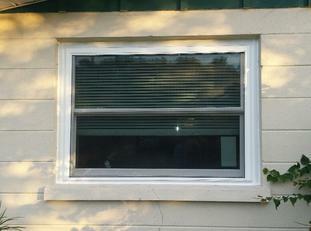 After: New CWS Acrylic WeatherLite Windows. 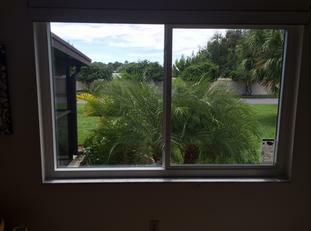 These windows are part of our “Comfort Space” designs, and have been a very popular option with customers looking for an alternative to glass windows that can be very costly when enclosing an outdoor living space. 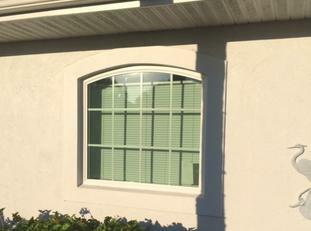 Before: Old aluminum “jalousie” style windows on this Bradenton home. 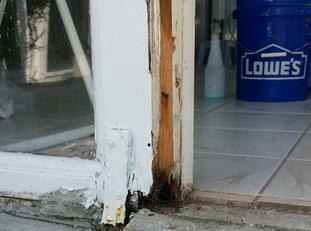 This customer had screwed the window shut to try and cut down on bugs and debris. Luckily they never had an emergency where these old windows could have created an escape hazard such as a fire. 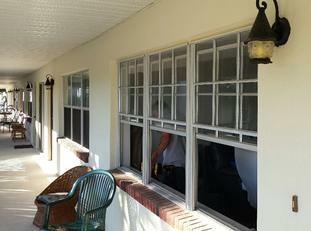 After: New PGT 500 Series Double Hung Winguard Windows installed around the entire home. With full screens, both sashes tilting in for cleaning and perfectly adjusted balancers for easy operating of the windows, we have another very happy customer! 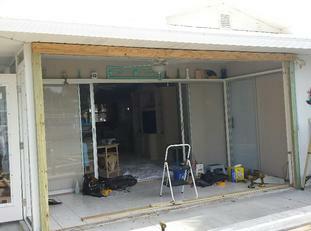 Before: This project was a complete overhaul of a space that was formerly a patio / lanai space. It had old aluminum jalousie windows which no longer operated and had been screwed shut. The door and all of the support beams were rotting away, making this space susceptible to major damage in the near future. 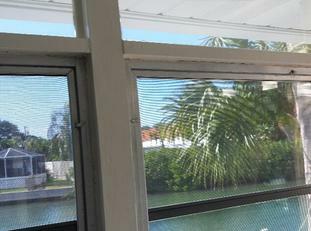 This Siesta Key family contracted us to create a multi-functional, yet safe and secure “Comfort Space”. As you can see, this room overlooks the pristine waterway and was hindering the family from truly enjoying water-front living. This is a perfect example of the type of quality work our Factory-Trained and Certified Installers are performing on a daily-basis in the Tampa and Sarasota area. Give us a call today for more information about transforming your space! 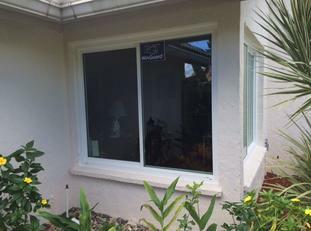 We were contracted by this Tampa Family to replace all of the existing single-pane aluminum windows with new Impact Rated windows. 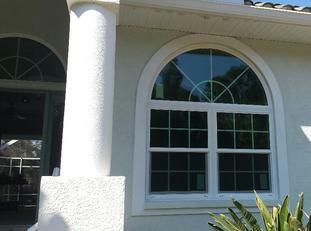 The windows pictured are PGT 500 Series Winguard Windows with custom decorative grids between the glass to create the look they’ve always desired. 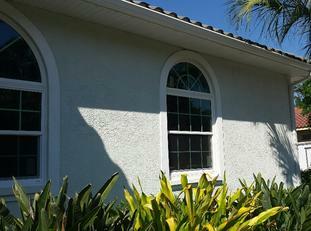 These PGT Replacement Windows feature laminated insulating glass with low-e, which means they are Hurricane Rated and Energy Star Rated, providing the maximum energy efficiency available. 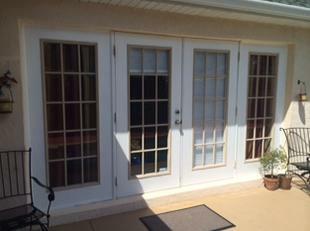 French Door Replacement Project Completed! 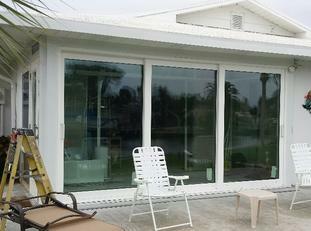 This Clearwater home was in desperate need of new French Doors that opened out to the beautiful pool patio. The old doors suffered from severe UV and water damage, as well as typical wear and tear commonly seen on contractor grade doors that see a lot of use after just a few years. We removed the old doors, repaired the interior trim that had rotted, and installed brand new Impact Rated French Doors with Energy Efficient Low-e Glass. These doors will stand the test of time due to the improved build quality of the fully reinforced door panel, new composite PVC jambs, aluminum threshold and impact rated glass. With multiple color options available for the threshold, hinges and hardware, and your choice of hardware style, we can provide the doors you’ve been looking for, with unbeatable pricing and service to go with it! 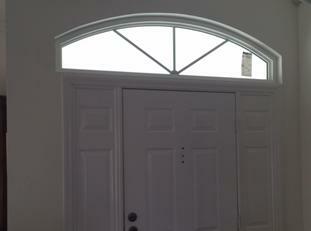 Better yet, we also put our Transferrable Lifetime Warranty on every door we install. 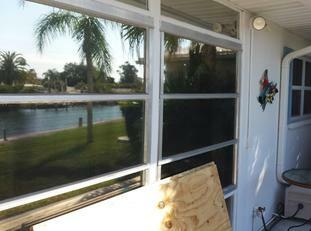 Window and Door Replacement Project Completed! 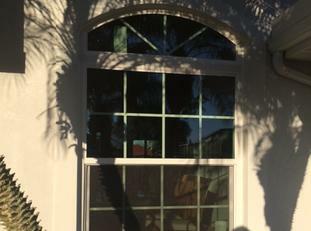 This Palmetto home got a fresh facelift with all-new PGT 500 Series Winguard Windows and Sliding Glass Doors. All of the windows on the front of the home were required to have decorative grids to match the rest of the homes in the neighborhood, and the remaining portion of the home did not need them. 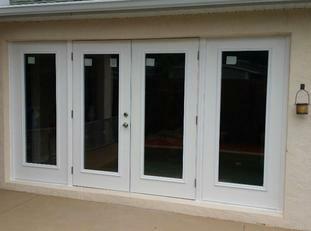 All of the windows and doors are Impact Rated and Energy Star rated with low-e and argon gas. 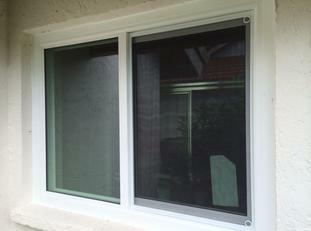 The frames are white vinyl and all of the windows have double locks and screens over the operating portion of the window. This home used a mixture of horizontal sliding windows, single hung windows, picture windows and architectural / custom shapes.